What's on the menu tonight? Well, it always depends on whether I've had time to peruse Yummly, Facebook postings or one of the multitude of cookbooks and food magazines I own. I don't mind cooking, but honestly get bored with it on a daily basis. It becomes a chore instead of an act of creation. My youngest brother is an amazing cook who puts me to shame. He also has practically every cooking gadget out there. I asked him once why and he said to help keep up his inspiration to cook healthy food every day. If it wasn't for that he would struggle. I don't have the dollars to purchase or room to store all those gadgets, so exploring recipes created by others is the option that works best for me. If you are also one who likes to try new recipes and have never checked out the Yummly website, you should. It offers a wide variety to explore from a huge number of cooking blogs. They give the basics, then you follow a link to the actual site to get the full instructions. I've used several and so far they've all turned out fine. I noticed this recipe for Tuscan Kale, Sundried Tomato and Chicken Sausage Gnocchi a week ago and quickly copied it into a draft file. It's credited to Megan of With Salt And Wit. Tonight's the night it will hit my table. Overall it doesn't look too complicated or time consuming, has great plate appeal and the mix of flavours looks promising. I love Kale more than the rest of my family, so I'm hoping this will be a dish that will help them embrace this great green more fully. 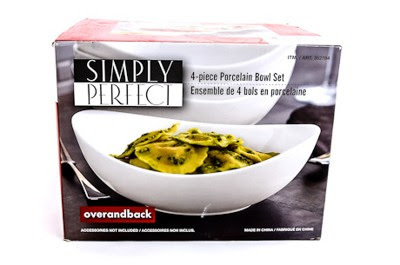 I also love the convenience of a one pot meal and have a set of these great oval porcelain bowls by Simply Perfect I use to serve recipes like this. I picked up mine from my local Costco about a year ago. Notes - Finally had a chance to add my notes here. I found the flavour good, but the dish overall a bit dry so worth playing with. I will be changing the tomatoes next go around to either the in oil variety or to fresh tomatoes. In oil would be more Tuscan. If I go that way and it still seems a bit dry I will add a bit of thickened broth - just a tiny amount to moisten things up. In a large skillet, saute the sausage until cooked through, 8 - 10 minutes. Add the chopped kale, portobello mushrooms, sun dried tomatoes, garlic powder, red pepper flakes, salt, pepper and dried basil. Continue to cook until kale is wilted and mushrooms and tomatoes are soft. Meanwhile, cook the gnocchi according to the package instructions. Drain and set aside until the meat mixture is cooked if they finish before. Once the gnocchi is finished, add it to the meat mixture along with the parmesan cheese. Toss well. Divide between 4 bowls and top with additional parmesan, if desired. (Note -great reheated the next day).